New trees provide shade and help to combat pollution. Photo: W1W Tree Planting Initiative. There is plenty of evidence to show that people feel better in green spaces. But trees can also contribute to storm-water management, absorb traffic noise, and provide shade which helps to reduce skin cancer. Trees are the lungs of our city, and have a calming effect on our neighbourhoods. 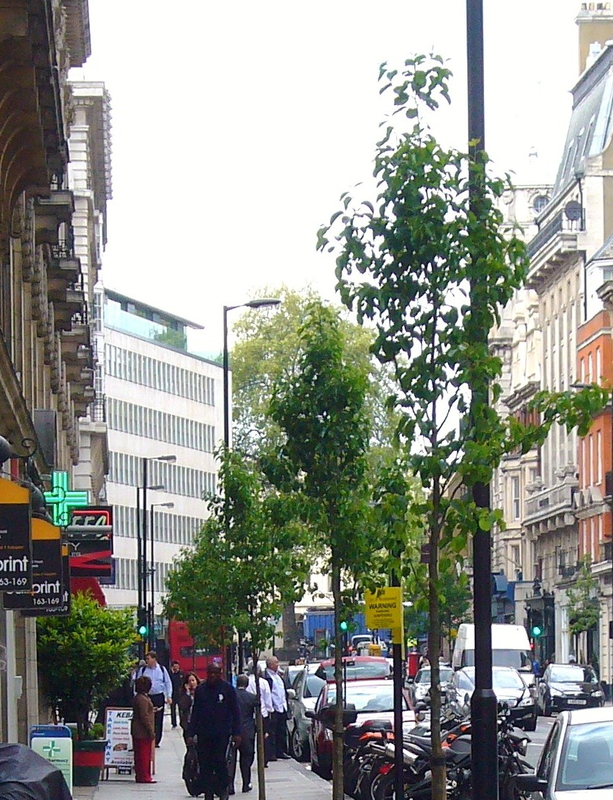 Approximately 280 trees have been planted in Marylebone since 2008 by the W1W Tree initiative. Their aim is to plant a further 220 trees by 2012 in time for the Olympics. In April this year celebrity gardener Alan Titchmarsh completed the greening of Bolsover Street by planting an Elm tree. He said: “Our children will never see a full grown Elm Tree in the same way that we did, but hopefully, thanks to work like this, our grandchildren will.” These new Elm trees are resistant to Dutch Elms disease which depleted our stock in the 1960s with bark-boring beetles. In June Professor Lord Winston was guest of honour for the tree ceremony in New Cavendish Street. He said “Trees do so much silently. One tree will use about two to four kilos of carbon per year. 49 of these trees will mitigate against one person’s entire carbon footprint”. Now the W1W initiative aims to continue these efforts in East Marylebone and Fitzrovia. Holcroft Court is one of the areas in line for improvement. And, as this building is set back from the road, it provides a unique opportunity to create a green space that offers a healthier and more productive communal space. In the past, trees were not really considered worthwhile. Now that opinion is changing. Trees increase the value of property by between five and 15 percent, and a mature tree by as much as 27 percent. Whilst giving character and a sense of place, trees are also the high-rise guardians of the urban environment. Plus there is also evidence that trees help to lower stress and illness levels. All these hidden benefits will not only help the present generation, they ensure that we have fulfilled our obligation to future generations.